SIHM Tirupati/ SIHMTPT BSc(HHA), Crafts, Diploma, Craftsmanship courses Admission 2017 notification: The State Institute of Hotel Management, Catering Technology & Applied Nutrition, Tirupati (SIHMCT & AN) has given the Various courses admission notification 2017 and applications are invited from the eligible candidates for admission into B. Sc (HHA) in Hospitality & Hotel Administration, Crafts course in food production & Patisserie, Craftsmanship Certificate course in Food & Beverage Service, Diploma course in Bakery & confectionary. Courses offered: The course curriculum / syllabus adopted at the academic according NCHM, aims at providing the students hands on practice education with experimental inputs, including personality development traits with a sense of hygienic, grooming , good communication skills, positive attitude and commitment towards productive work and specific skills orientation. The Institute offers the following courses. A pass in 10+ 2 system of scenario Secondary examination or its equivalent with English as one of the subjects. Candidate must have passed English as a subject of study (core/elective/ functional) in the qualifying examination. Age Limit: For B. Sc., (HHA)in Hospitality Hotel Administration For candidate from General and OBC categories, upper age limit is 22 years. In the case of Scheduled Caste and Scheduled Tribe candidates, upper age limit is 25 years. based on the All India Rank (AIR) earned by the candidate in the written test of JEE. • Ranks are based on the marks obtained by the candidate in written examination. No group discussion or interview are involved. • Counseling involves checking of eligibility of candidates, verification of documents, depositing of counseling and first semester fee and opportunity to opt for choice of Institutes as available at the time of his/her counseling as per his/ her AIR. Candidates should give as many choices after evaluation of Institutes based on information available in their respective websites. • Allotment of Institute shall be as per merit (AIR) and choice of Institute exercised by the candidate. Crafts course in food production & Patisserie For candidate from General and OBC categories, upper age limit is 25 years. In the case of Scheduled Caste and Scheduled Tribe candidates, upper age limit is 28 years. Selection would be on the basis of marks obtained in the qualifying examination and personal interview. Application form and prospectus may be obtained from the State Institute of Hotel Management, Catering Technology and Applied Nutrition, Tirupati at the following address, on payment of Rs.300/- for General & OBC category, Rs.200/- SC, ST, by cash or a demand draft favoring "Principal SIHM Tirupati". The filled in application should be sent to the following address with enclosures. For more information about admissions contact Admission Coordinator - +91-9701343046. ❖ The Application form should accompany a set of Xerox copies of marks list of qualifying examination, Caste Certificate, D.D. etc. ❖ Upon submission of application, candidates will be called for personal interview. All the students should their certificates of S.S.C. (or 10th) Intermediate, Transfer certificate and other certificates in original along with Xerox copies at the time of admission for verification without fail along with 8 passport size photos. Note: 1st installment should be clear at the time of admission and 2nd installment should be cleared before 2nd week of December. The fee is payable only by demand draft drawn in favour of "Principal, SIHM, Tirupati". he State Institute of Hotel Management, Catering Technology & Applied Nutrition, Tirupati (SIHMCT & AN) is sponsored by Govt. of India ( Ministry of Tourism) and Govt. Of Andhra Pradesh. (Department of Tourism)and under affiliation of National Council for Hotel Management Catering Technology And Applied Nutrition(NCHMCT) New Delhi. Govt. of Andhra Pradesh has earmarked 5 acres of land near Alipiri, Tirupati. 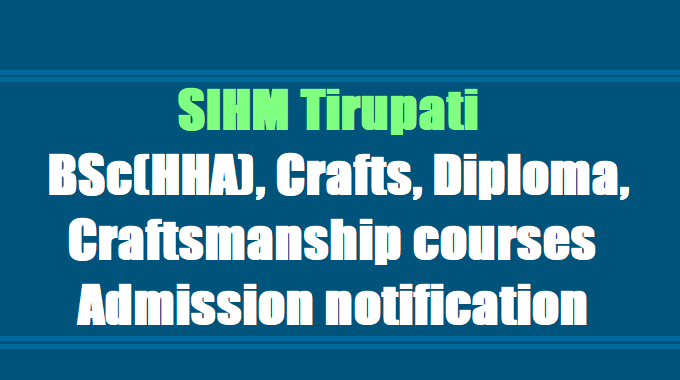 The SIHMCT & AN, Tirupati is conducting short term craft courses in the Hotel Management trade established from the academic year 2009-13 temporarily in the Centrally located Campus of S.V.Polytechnic College, K.T. Road, Tirupati. From 2014 Academic year onwards located permitted premises by present college address. Vision: State Institute of Hotel Management Catering Technology & Applied Nutrition takes pride in the global vision of imparting quality education and creation of man power or the need of professional working on the ancient Indian culture service through good will and happiness, "Athithi Devo Bhava". Our Mission: To provide professional education by offering relevant recognized qualification and an overall personality development of our students through good discipline for shaping young men and women aspiring to become leaders in the Hospitality and Tourism Management Industry. We at the State Institute of Hotel Management & catering Technology are committed to excel in the field of Hospitality Education, by moulding the students from all across sections of the society and enhancing their skills to meet the challenges of the dynamic business and Hospitality environment. • Provide research oriented atmosphere for continual improvement and development of the faculty to keep them abreast with the latest trends in the hospitality Industry. • Ensure optimum quality of Infrastructure and Resources thereby enabling students satisfaction. • Facilitate students' learning by providing opportunity for financial assistance through scholarships.